According to the Environment Agency statistics for 2015 (Cycle 2), 84% (492 of 585) of waterbodies in Yorkshire do not achieve ​‘good ecological status or potential’ under the European Union Water Framework Directive classification. To contribute to countering this worrying statistic, our northern Conservation Officers, Jonny Grey & Gareth Pedley will deliver projects across Yorkshire in line with the government’s Catchment Based Approach plans for river management. 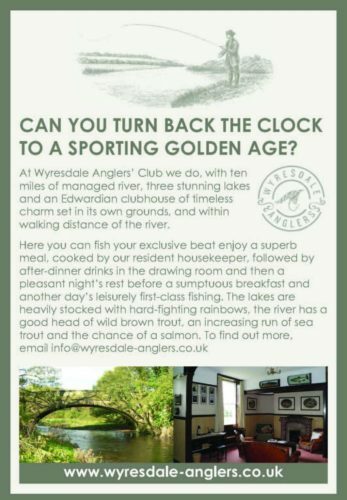 These will be in collaboration with the EA, the rivers and wildlife trusts, anglers and local community groups, under a new partnership developed between Wild Trout Trust and Yorkshire Water and supported by the Yorkshire Water Biodiversity Fund. We will run a series of hands-on events, where groups can get directly involved in practical work to restore, improve and maintain becks, rivers and wetlands and their environs. Each event will highlight to participants the pertinent issues impacting upon the environment at a particular site, such as water usage, land use, barriers to connectivity, and pollution. Then we will carry out focused habitat improvements, working to make life better for the plants and animals that live by and in the water, and the local people who enjoy their surroundings. Our goal is not only to significantly improve the condition of rivers and wetlands in Yorkshire using professionally guided volunteers and community representatives, but to create, as a legacy, a network of environmental stewardship groups to care for these vital areas into the future. On the Aire at East Riddlesden, Jonny is coordinating a project to restore two spawning tributaries and create a large semi-permanent wetland which will not only benefit wildlife but also contribute to natural flood management. This is a partnership with the National Trust, Yorkshire Wildlife Trust, Bingley Angling Club, and local volunteer groups. On the Nidd, Knaresborough Anglers will be working with Gareth and volunteers over a couple of days to create and restore riparian cover. In collaboration with the Yorkshire Dales Rivers Trust and their Mid Swale Tributaries Project, work is planned to reduce the amount of diffuse pollution, essentially soil, entering Skeeby Beck. If any of these events are local to you and you are interested in attending, please contact Jonny in the first instance. Keep up to date with developments via the news pages, via Twitter, or via the WTT Blog.